Controls 6 slave SPI ports using 7-wire SPI master port. Cascadable: over 1 million slave ports. Slave port INT feedback to master port. JTAG programmable for the (ATF1504AS) CPLD developer. RobiCon compliant board outline, mounting and connectors. 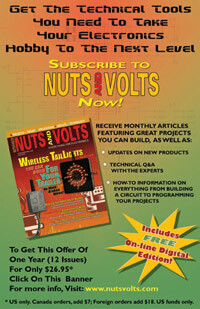 "Control dozens of SPI devices from your microcontroller!" Assembled and tested board only. Cables sold separately. Cost effective bundles with cables available soon! SPIRIT provides robust, scalable SPI networking capability for the control of several to large arrays of slave SPI devices using 7 pins on the host processor. 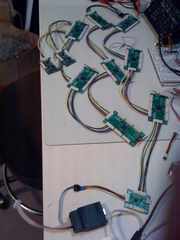 The individual board provides the ability to control 6 slaves; multiple levels of SPIRIT hierarchy allow many more (6n levels) ports to be controlled, still using the same 7 pin host interface. Indicator LEDs are placed at every SPI port, allowing the display of port activity. An INT feedback path from the slave ports to the host allows rapid response to events at the slave nodes. Code is available for download to speed development of your applications, with examples of various functions such as LED control, port selection and a fully scalable software interface. 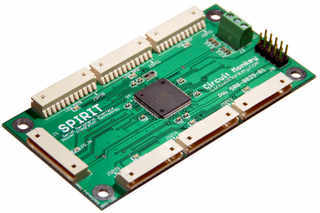 SPIRIT is powered by a Atmel ATF1504AS programmable logic device chip. 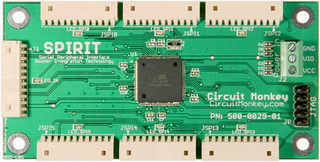 Each SPI port features an activity LED at each connector. Measuring 10cm x 5cm (4in x 2in) the SPIRIT router is mechanically and electrically compliant with RobiCon.org specifications. 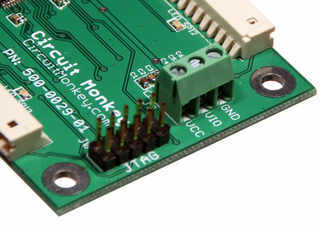 Each SPI connection is a RobiCon 11-pin connector which pins out the base SPI pins (SCK, MISO, MOSI, SS) as well as interrupt plus two address lines (INT, M0, M1). Each SPI connector can also supply +5VDC at up to 500mA to each SPI device (when a sufficient power source is used). 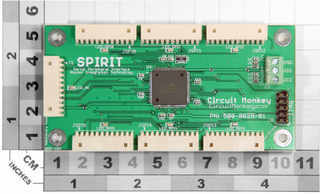 The SPIRIT board also features external power input via a terminal block connection with separate inputs for the chip's Vcc and Vio power rails. In addition, a standard 10-pin JTAG header is present to allow reprogramming of the PLD array, making the SPIRIT board also appropriate for general development of Atmel ATF1504AS based devices.